Dwelling on what is really essential in my wardrobe I just realised that the garment I fall back on most of all is my navy pants. In fact I have two pairs. An old Max pair from spring 2010 I am still wearing, and French Connection highwaisted baggy sailor pants from 2008! As both are literally wearing a bit thin, I am in the market for a new pair. Navy pants go with anything, and force you into not wearing black even on footwear. I can team with that white teeshirt and the breton top I’ve blogged about and many other things I have up my sleeve for the week’s ahead. They turn casual into smart casual and always look simply fabulous as these pics depict. And as I do take a pair to Great Barrier Island so I can go from airport direct to meeting on my I return, they really are an item I could be stranded with! 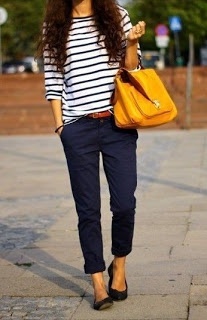 Navy pant gorgeousness with mustard and stripes…. ← Chevron knit dress – it’s a sign!